Well...today, it's tomatoes. 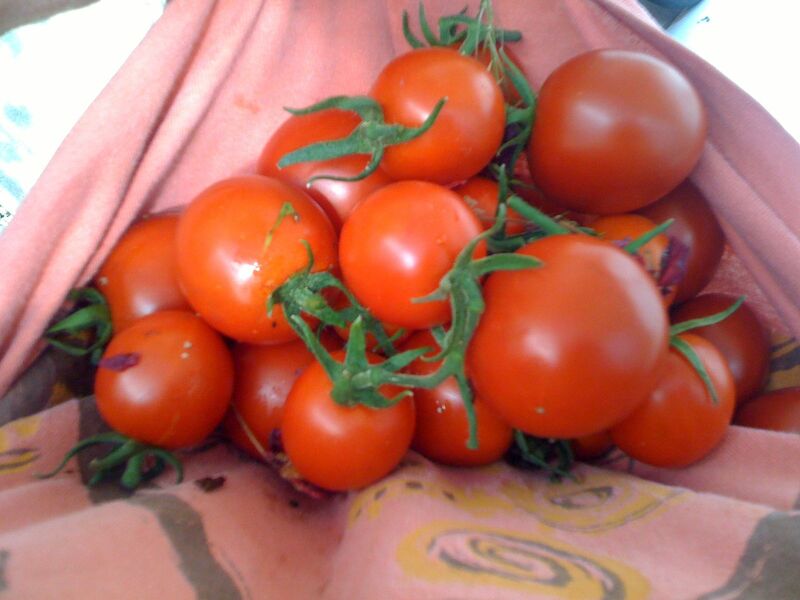 Anila has an heirloom tomato plant that's cranking out these babies in our greenhouse. I have two bowls of them and need to do something to save them today. Thinking I'll just stew them up and freeze them. Any suggestions? I'm down to the wire...I only have this afternoon. Fast is good. No time for canning, or I would (actually, not enough to bother with for all the trouble). Tomorrow I fly back to CA. It has been a great three weeks. Project Decrap is finished, for now, and it feels just great. I even managed to get some stuff weeded out here at the house. Now I'm all organized so when I return later this fall, I can get right to work on reopening my little Etsy shop. Only five more weeks until our new family member arrives. From the perspective of the person who is not pregnant and not lying on my side all day, everyday, 24-7, it seems like it has passed rather quickly...and I know these next weeks will just fly. Awesome! I vote for stewed and frozen. But keep out 2 of them and make yourself a toasted tomato sandwich with lots of mayo first. Yum! I adore tomato sandwiches. Great suggestion, Kim. I'm on it, now! It is, Shawn...and it seems like just yesterday I was reading about the safe arrival of Finn. Amazing! I am looking forward to the re-opening! I can't believe it will be just a few short weeks before arrival, too exciting. Good luck to all! Good morning....found you over at Maggie's......Love your header pic as sunflowers are one of my favorite flowers.....and Santa Fe is one of the best spots in all the world to visit and enjoy....and Taos.....need i say more....just so special. We usually visit once a year while traveling....glad I found you. Hi Jo! Welcome to my little blog. Nice to meet another sunflower lover...is there anything more cheery??? Our yard in Taos fills up with wild sunflowers each year and it's just so much fun. Hey honey so glad I stopped by tonight for a visit. You did get a lot done while you were there. These tomatoes look wonderful. The last few sites tonight that I have been on have made me hungry. Toasted tomato sandwich? I've never tried that, but I have plenty of tomatoes in my garden, so I'll have to try one sometime this week. Glad to read things are going well for you Martie! Hope all is well out there. Project Decrap...now that's project I need to start. Things are going well, Jack. A baby is due in about 4 weeks...and I will head back to Taos later this fall. It is astounding how quickly these months here have passed. Good to hear from you! You are a terrific Mother-in-law.......that's all I can say. Keep us posted.......we are all like a bunch of Mother (and Father) Hens. Hummmmmmmm that didn't come out right - but you know what I mean!